Hello lovely readers, I do hope that your Saturday is a very good day. 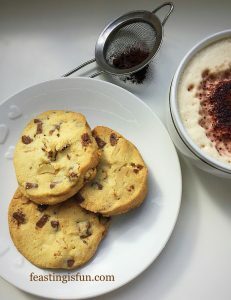 I always start my day with a cup of tea and cookie and my Sour Cherry Chocolate Chip Cookies are perfect with my cuppa. So I’m going to be honest, I’m not a massive fan of dark chocolate, in any form, to eat, just as it is. Melted and mixed into a cake batter – not a problem – although if it’s a very chocolatey cake I usually don’t have more than one slice. Dark chocolate, although usually the best chocolate to use when baking, well, it’s just a bit too intense for me. 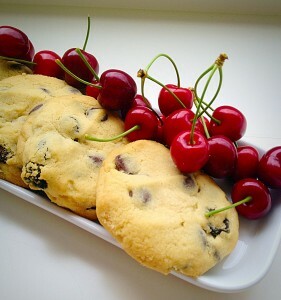 Here, however, in these Sour Cherry Chocolate Chip Cookies it was absolutely necessary to use good quality, dark chocolate chips. 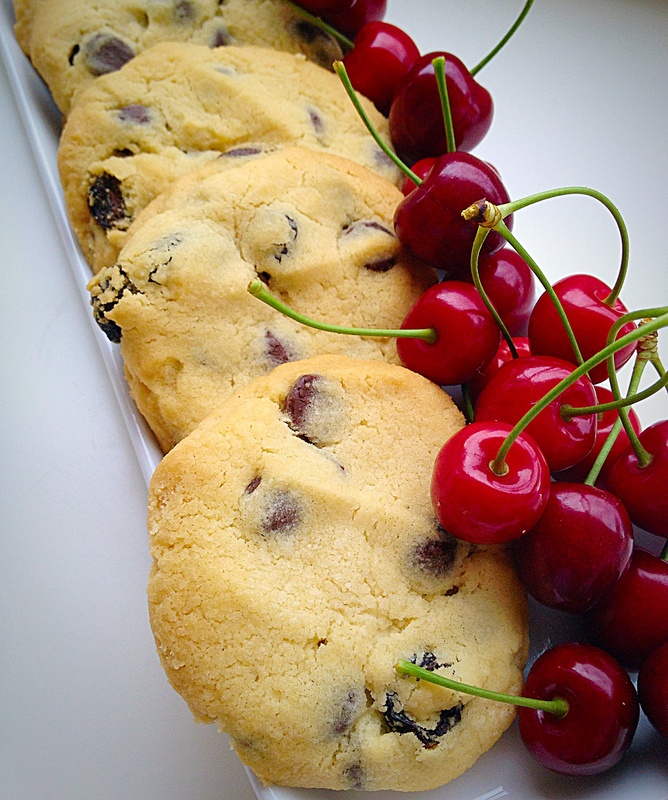 Because the contrast against the sour, chewy, cherries balances the flavours in this buttery cookie perfectly. You’d think with 3 growing teenagers in the house, everything I bake would get eaten and mostly it does! There have been a few failures over the years and I guess, because they’ve eaten good, home cooked food all their lives, they’ve become very discerning!!! 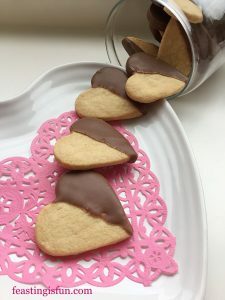 Most goodies achieve an 8 out of 10 score (and that’s high praise indeed), these cookies got a gold star. 10 out of 10!! 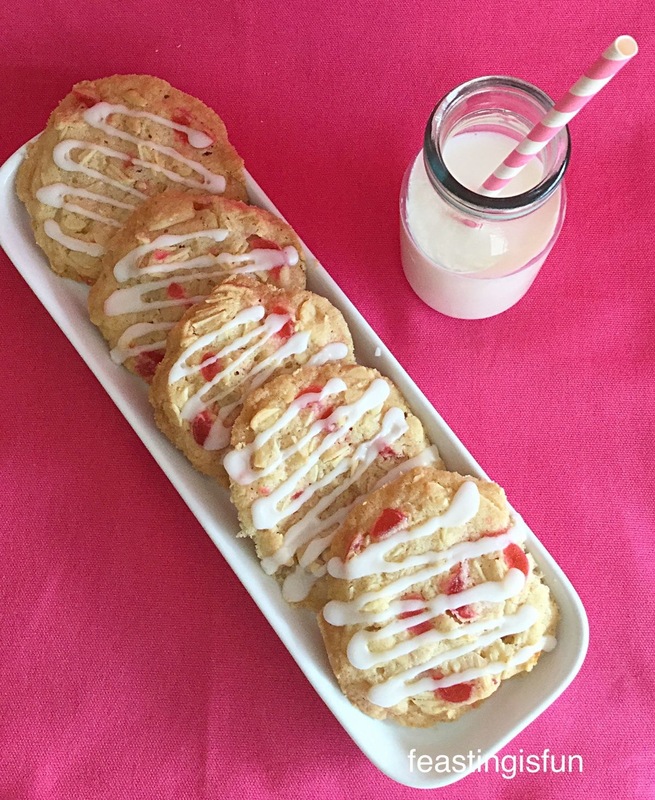 I love baking for others, especially my family. 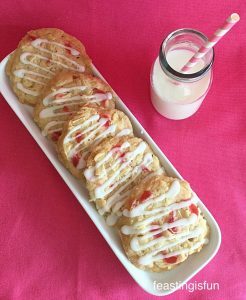 Their encouragement and honesty help make me a better cook/baker. It’s also another way for me to show them how much they are loved. I find the process of baking very relaxing and rewarding. It’s lovely to bake a cake for someone, just because you love them, or remember a particular friend, who loves meringue but rarely eats it as her hubby is diabetic. Little thoughtful treats, to show, in this fast paced world, that you’ve taken time, for that particular person. Makes me go all warm and fuzzy inside. 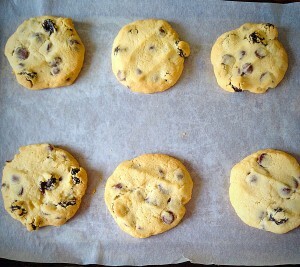 So I’d better show you how to make these buttery, yummy, Sour Cherry Chocolate Chip Cookies so you can share them too!! 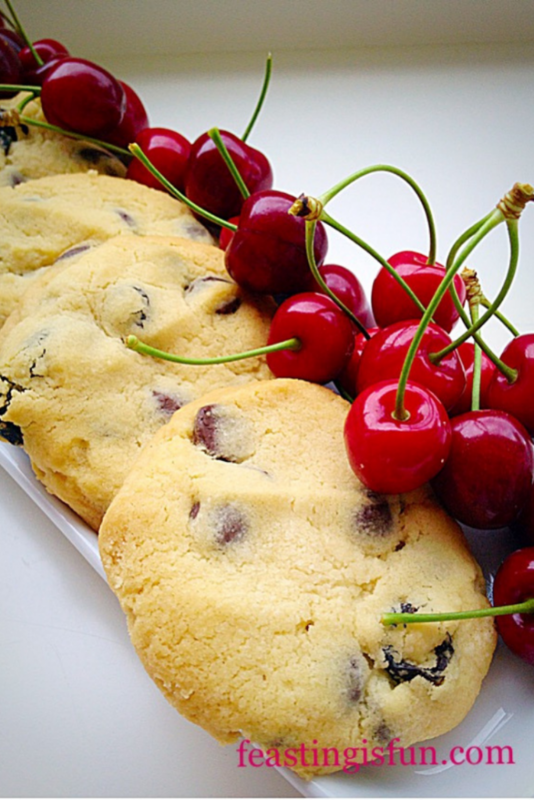 Recipe : Makes 20-25 Sour Cherry Chocolate Chip Cookies. 225g/8oz Unsalted Butter – room temperature. Method : Preheat oven to 180C/160C fan, gas mark 4, 350F. 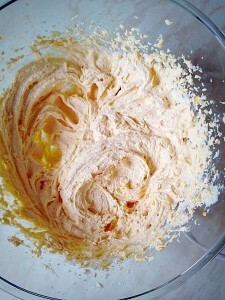 First of all in a large bowl whisk together the butter, sugar and salt until light and fluffy. Next add the egg yolk and vanilla extract. 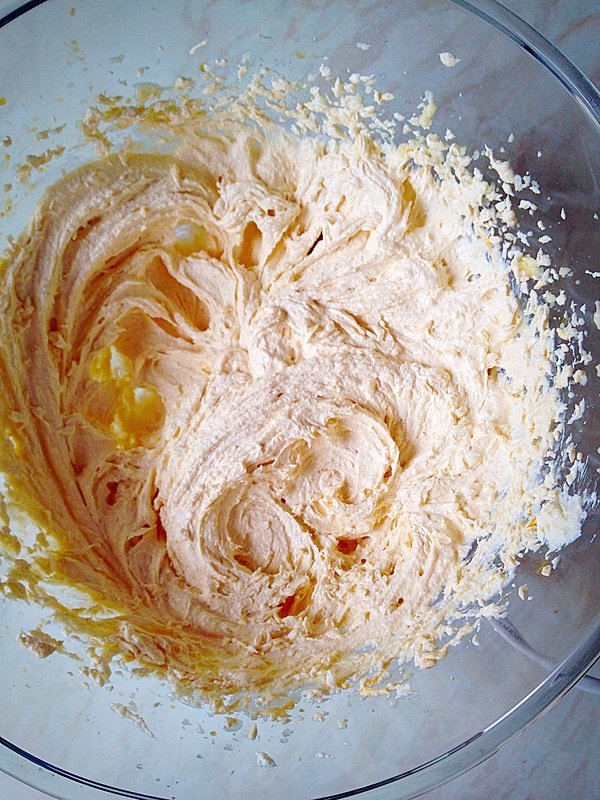 Continue whisking until fully incorporated. My egg had a gorgeous orange yolk and I used golden caster sugar (it was on offer!! 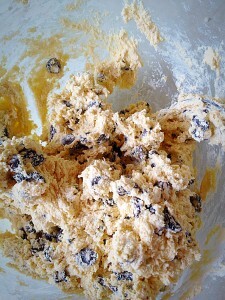 ), so the mixture has more colour than usual! 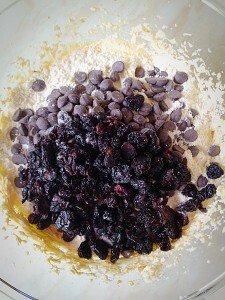 Add in the flour, chocolate chips and dried cherries. Mix all the ingredients together slowly, I like to do this by hand using a spoon, until they just come together. The more you mix the tougher your cookie will be! 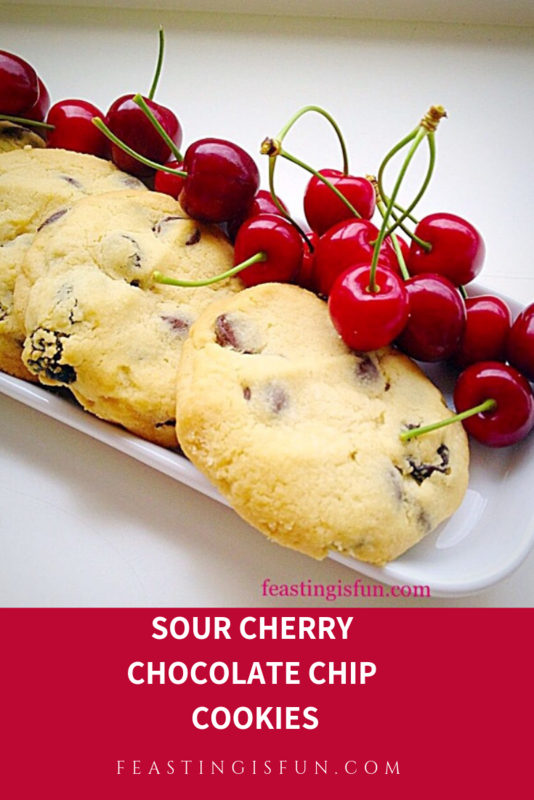 The dough for your Sour Cherry Chocolate Chip Cookies – resist the urge to taste – or not!!! Using a 5cm/2″ ice cream scoop, or your hands, make balls of cookie dough and place on the parchment lined baking sheet. 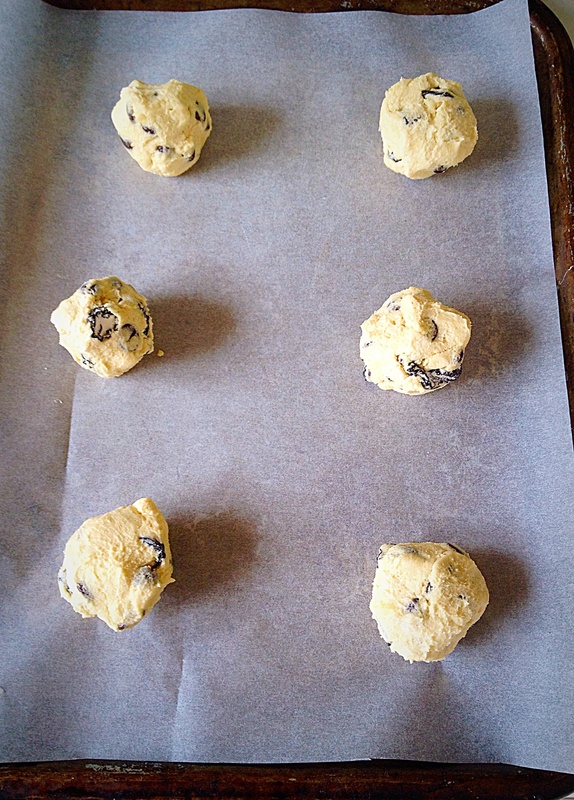 With clean hands lightly press down on the dough balls to flatten them. The imprint of your fingers leaves a pretty pattern. 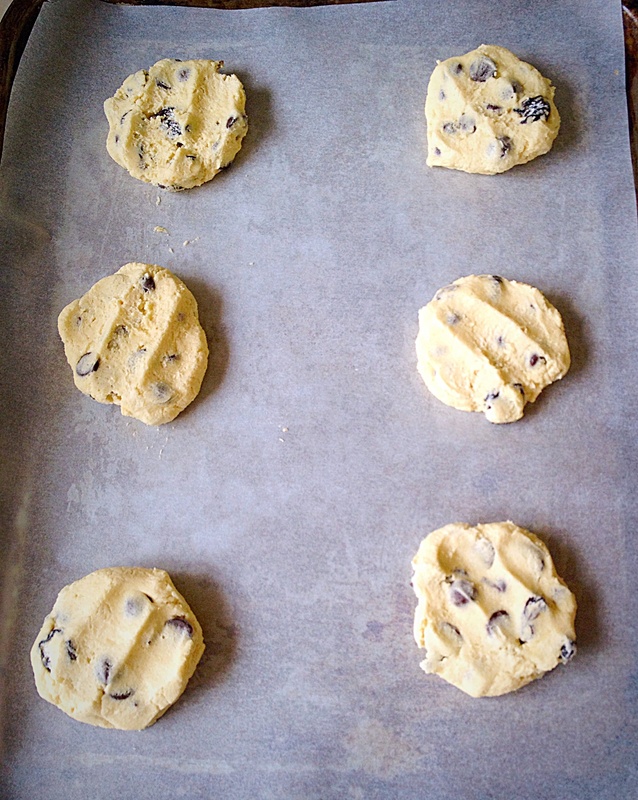 Place in a preheated oven and bake for 18-23 minutes until golden brown on top. Sour Cherry Chocolate Chip Cookies – remove from the oven and leave to cool on the baking tray. The cookies will still be soft once cooked and will firm up on cooling. Time to put the kettle on or pour a nice glass of milk. 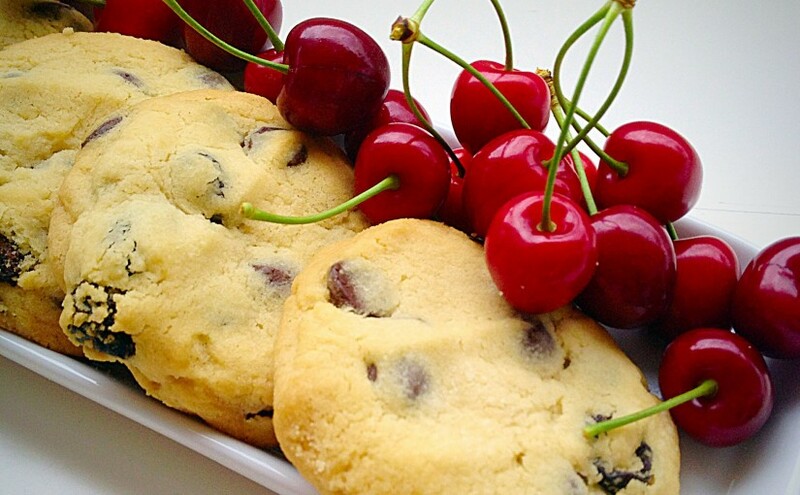 Once cooled enjoy biting into the buttery, chewy, chocolatey gooey Sour Cherry Chocolate Chip Cookies! Do you find baking relaxing? If so, what do you enjoy baking the most? No part of this post may be reproduced or replicated without the written permission of the owner. Please see my Disclosure Policy.